10:30 to 3 pm Wednesday through Sunday. Last entry 1pm. 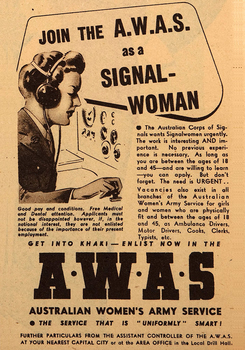 The focus of the collection is to tell the story of the Australian Army in Western Australia and Western Australians in the Army. Galleries cover the period from initial contact through to the present. 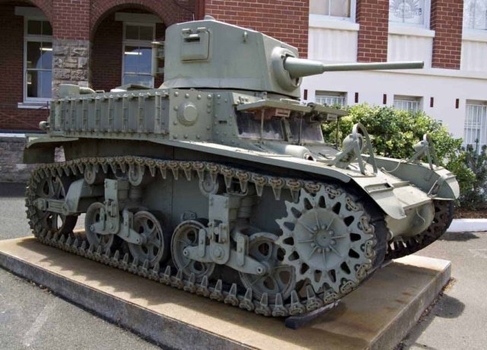 Collection items include large armoured vehicles and artillery pieces, weapons, uniforms, medals and personal equipment. The social history of military service and conflict is presented through diaries, oral histories, personal archives and personal objects. The collection includes connections to next of kin, bereavement, repatriation and commemoration. 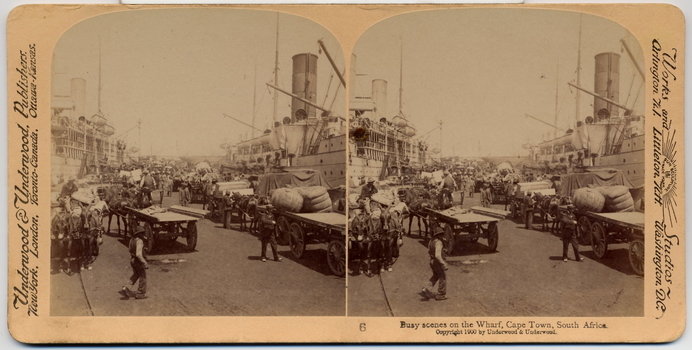 The 1st Contingent departed Fremantle on 7 November 1899 and returned on 29 December 1900. 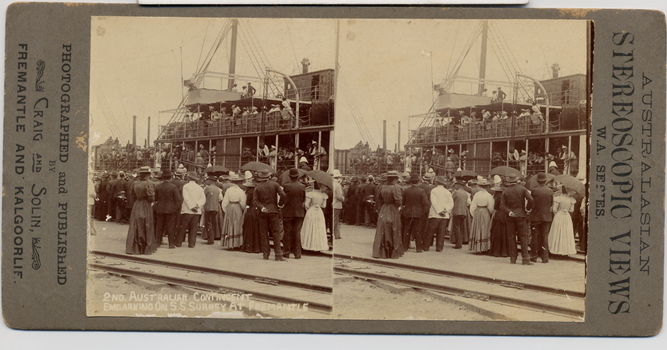 The 2nd Contingent departed 3 February 1900 and returned 8 December 1900. Due to the shortage of khaki material, the 1st Contingent uniforms wore their blue militia tunics, blue puttees and a dark blue puggaree on departure. An Anglo Boer War Service of Reconciliation is held annually on the first Sunday in June at the "Fallen Soldiers" (Boer War) Memorial in Kings Park attended by descendants and representative of all combatant nations. The date selected is the closest Sunday to the date of signing of the Treaty or Peace of Vereeniging (31 May 1902). The culmination of the service is the laying of the Emily Hobhouse wreath. 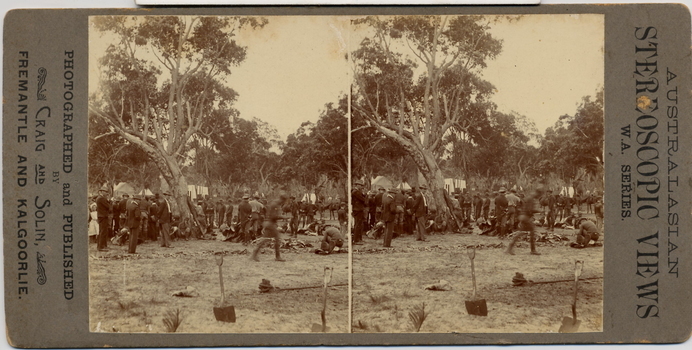 Unique series of stereoscopic images showing both the 1st and 2nd West Australian Mounted Infantry Contingents to the Anglo Boer War. 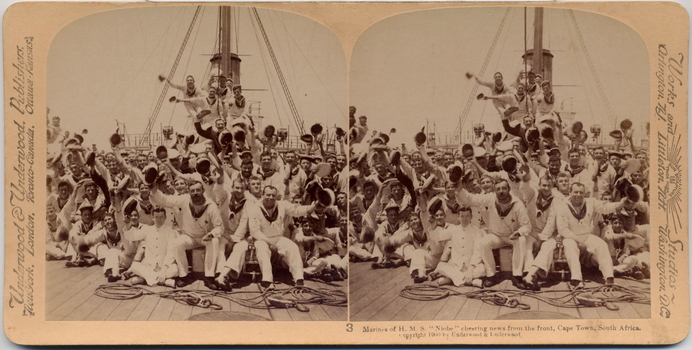 Images contain details of uniforms, accoutrements, camp life, civic honours and departure. This former King's Colour was originally authorised by King George V in 1919 in recognition of services of 11th Battalion (AIF) during the Great War. 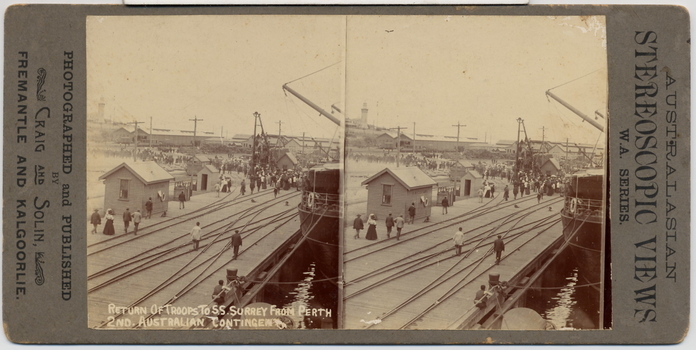 Presented by HE the Governor General Sir Ronald Munro-Ferguson, PC, CGMG at a parade in King's Park on 2 October 1920 and handed over to 2nd Battalion, 11th Infantry Regiment (Perth Regiment) of the Citizen Forces. In 1921 this unit became re-designated 11th Battalion (The Perth Regiment) (The title was changed to "The City of Perth Regiment" in 1933). Subsequently consecrated by the Chaplain General, Archbishop COL Riley, OBE, VD, DD at a parade on the Esplanade, Perth, 15 November 1924. At the time of presentation this colour was a plain union flag with no central devices or other distinctions included on it. Following Military Board approval given in 1925 the centre circle and Crown were later added, in accordance with the approved design for a King's Colour. With the re-activation of the Citizen Military Forces (CMF) following the Second World War, the 11th/44th Infantry Battalion (The City of Perth Regiment) was raised as a linked battalion in 1948 to carry on the identity and traditions of the pre-war 11th and 44th Battalions respectively. 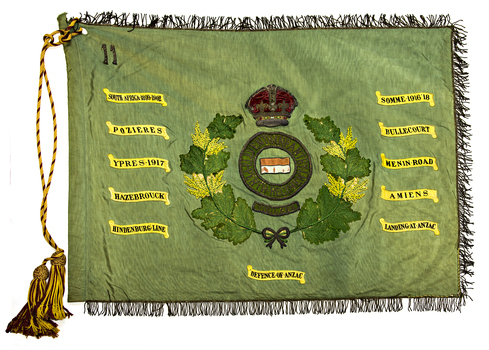 The King's and Regimental Colours formerly held by these two battalions were passed on to the new battalion who paraded them in rotation on ceremonial occasions. With the accession of HM Queen Elizabeth II to the throne in 1953, all Colours that had originally been presented as King's Colours, and were still carried by units on the current Order of Battle, were automatically deemed to be Queen's Colours. Under major reorganisation of the CMF in 1960, all individual infantry battalions that existed at the time within each State were amalgamated to form State regiments, taking effect from 1 July 1960. Thus from that date the 11/44th, 16th and 28th Infantry Battalions were amalgamated to form The Royal Western Australia Regiment. In September 1960, at a ceremonial parade held at Northam Camp, the Colours carried by all former battalions were handed over for safe keeping by the new regiment. Battle Honours for the Second World War were promulgated under Australian Army Order 135/1961 and the 10 selected honours approved for emblazoning on the Queen's Colour were subsequently added in 1962 These former colours were subsequently laid up in the undercroft at the State War Memorial, King's Park on 29 November 1964. 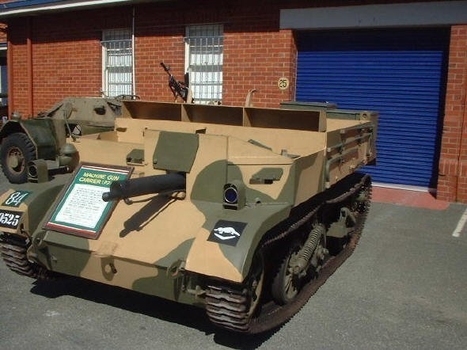 These were transferred to the Army Museum of WA in 1988 as part of the Bicentenary Colours Project. Union flag with gold fringes. In the centre the Arabic numeral "44" on a red background within a circle inscribed "FORTY FOURTH INFANTRY ", surmounted by the Imperial Crown. This former King's Colour was originally authorised by King George V in 1919 in recognition of services of 44th Battalion (AIF) during the Great War. Presented by HE the Governor General Sir Ronald Munro-Ferguson, PC, CGMG at a parade in King's Park on 2 October, 1920, however was not passed on to any AMF counterpart unit of the Citizen Forces, as one did not exist at the time. 44th Battalion (AMF) was formed in 1921 from elements of 16th and 51st Infantry Regiments and was presented with this colour by the Governor of Western Australia Sir Robert Furse McMillan at the Anzac Day parade on the Esplanade, Perth on 25 April 1922. The colour was subsequently consecrated by the Chaplain General, Archbishop COL Riley, OBE, VD, DD at a parade on the Esplanade, Perth, 15 November 1924. At the time of presentation this colour was a plain union flag with no central devices or other distinctions included on it. Following Military Board approval given in 1925 the centre circle and Crown were later added, in accordance with the approved design for a King's Colour. With the re-activation of the Citizen Military Forces (CMF) following the Second World War, the 11th/44th Infantry Battalion (The City of Perth Regiment) was raised as a linked battalion in 1948 to carry on the identity and traditions of the pre-war 11th and 44th Battalions respectively. The King's and Regimental Colours formerly held by these two battalions were passed on to the new battalion who paraded them in rotation on ceremonial occasions. With the accession of HM Queen Elizabeth II to the throne in 1953, all Colours that had originally been presented as King's Colours, and were still carried by units on the current Order of Battle, were automatically deemed to be Queen's Colours. Under major reorganisation of the CMF in 1960, all individual infantry battalions that existed at the time within each State were amalgamated to form State regiments, taking effect from 1 July 1960. Thus from that date the 11/44th, 16th and 28th Infantry Battalions were amalgamated to form The Royal Western Australia Regiment. In September 1960, at a ceremonial parade held at Northam Camp, the Colours carried by all former battalions were handed over for safe keeping by the new regiment. These former colours were subsequently laid up in the undercroft at the State War Memorial, King's Park on 29 November 1964. These were transferred to the Army Museum of WA in 1988 as part of the Bicentenary Colours Project. 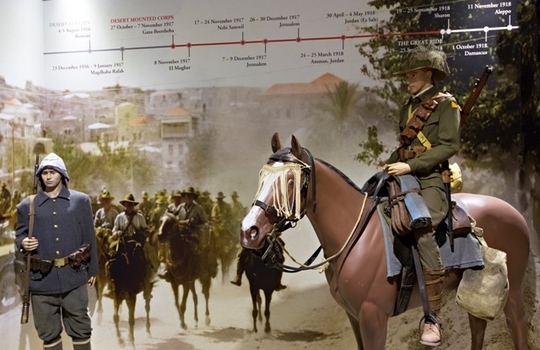 This diorama is the central feature in the World War 1 Gallery - Middle East Campaigns sequence and shows typical uniforms and accoutrements of the Australian Light Horse and Ottoman infantry. 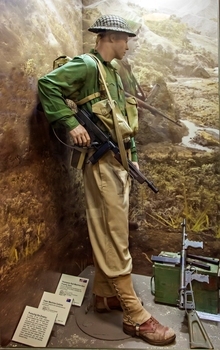 This diorama attempts to convey the conditions experienced and the country traversed during "The Great Ride"
With the re-activation of the Citizen Military Forces (CMF) following the Second World War, the 16th/28th Infantry Battalion (The Cameron Highlanders of Western Australia) was raised in 1948 to carry on the identity and traditions of the pre-war 16th and 28th Battalions respectively. The King's and Regimental Colours formerly held by these two battalions were passed on to the new battalion who paraded them in rotation on ceremonial occasions It was decided in 1950 that a new set of Colours would be presented to 16th Battalion. For reasons that still remain unclear, these were manufactured under local arrangement by "cannibalising" the original 1933 set of colours and transferring the devices and battle honours (in the case of the Regimental Colour) to the new Colours. (Reported by Western Command to the Adjutant General -reference file A 107/1/11 dated 30 April 1952). These new colours were presented by Major-General JS Whitelaw, CB, CBE at a parade of the 16th/28th Infantry Battalion held on the Esplanade, Perth, 26 August 1951. 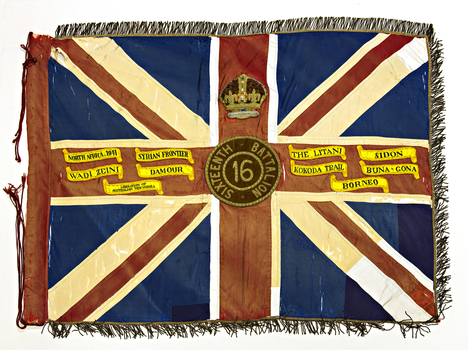 (For details of Colours previously presented to 16th Battalion see separate section below). 16th/28th Infantry Battalion became unlinked in March 1952 with both 16th and 28th becoming independent battalions within their own right. With the accession of HM Queen Elizabeth II to the throne in 1953, all Colours that had originally been presented as King's Colours, and were still carried by units on the current Order of Battle, were automatically deemed to be Queen's Colours. Under major reorganisation of the CMF in 1960, all individual infantry battalions that existed at the time within each State were amalgamated to form State regiments, taking effect from 1 July 1960. Thus from that date the 11/44th, 16th and 28th Infantry Battalions were amalgamated to form The Royal Western Australia Regiment. In September 1960, at a ceremonial parade held at Northam Camp, the Colours carried by all former battalions were handed over for safe keeping by the new regiment. Battle Honours for the Second World War were promulgated under Australian Army Order 135/1961 and the 10 selected honours approved for emblazoning on the Queen's Colour were subsequently added in 1962 These former colours were subsequently laid up in the undercroft at the State War Memorial, King's Park on 29 November 1964. 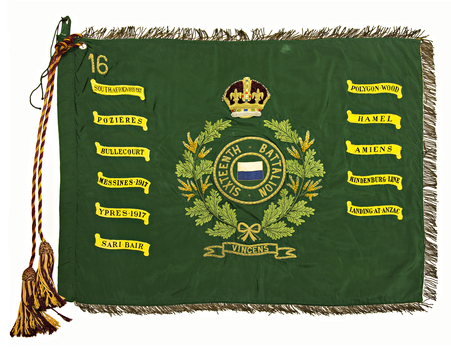 These were transferred to the Army Museum of WA in 1988 as part of the Bicentenary Colours Project Previous Colours presented to 16th Battalion The designation "16th" was allocated to several different infantry battalions that had been raised at different stages during changes to organisational structure of the Citizen Forces during the 1920's and 1930's. The original King's Colour awarded for service of 16th Battalion (AIF) and received in 1920 by the Citizen Force unit 2nd Battalion, 16th Infantry Regiment was later passed on to 16th Battalion (The Goldfields Regiment) which had been raised in the Kalgoorlie area in 1921. This unit became inactive and this Colour was later laid up in the Kalgoorlie Council Chambers. In order to maintain the identity of 16th Battalion as a Citizen Force unit, in 1930 11th Battalion (The Perth Regiment) was reformed as a linked battalion under the designation 11th/16th Battalion. 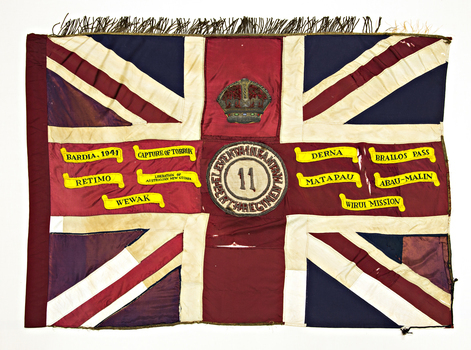 As the 11th Battalion had already received its set of colours in the 1920's, it was decided that a set of King's and Regimental Colours be presented for 16th Battalion. These were presented by HE the Lieutenant-Governor Sir James Mitchell, KCMG at a parade of 11th/16th Battalion held at Perth Oval on 15 October 1933. The colours were consecrated by the Chaplain General, Archbishop COL Riley, OBE, VD, DD. In 1936 16th Battalion was re-established as a separate battalion within its own right, being formed as 16th Battalion (The Cameron Highlanders of Western Australia). The colours presented in 1933 were passed on to this new battalion and were also initially carried by the post-World War Two unit 16th/28th Infantry Battalion (The Cameron Highlanders of Western Australia) as already mentioned. Transcription of poem by Signals instructor Sgt JF Larkins presented to Signal Woman Ruth Franklin during Training in 1943. Read during 75th anniversary commemoration of proofing of Oliver Hill Battery, Rottnest Island. Computer printed on A4 bond paper. 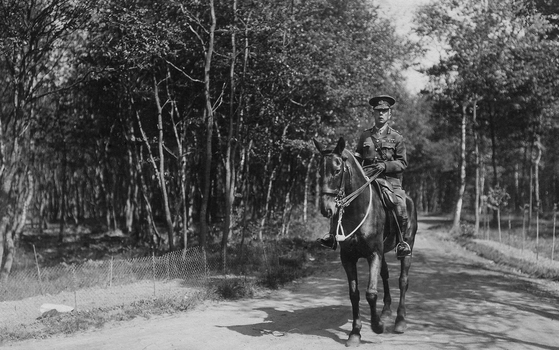 Last ride in Belgium, July 1914. Digital copy of photograph from a personal album of Lieutenant General JJT Hobbs. This diorama is the focal point the Prisoner of War Gallery. It was originally designed and installed by a collaborative group of artists and craftsmen, all themselves former Prisoners of War in 1995. Bamboo for the display and replica prosthetics was sourced from Thailand. The mannequins are artistic interpretations of identified POW surgical staff and doctors. The original display was moved and reassembled during the Gallery redevelopment process in 2015. 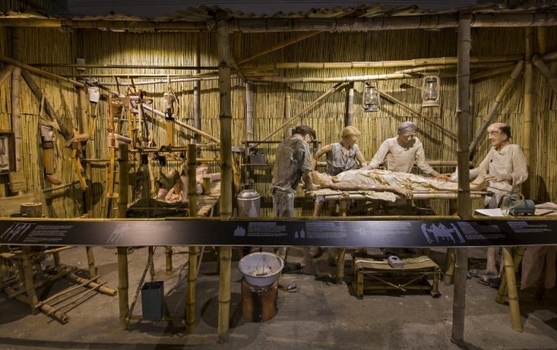 All items presented within the diorama are based on POW recorded drawings and diaries of experiences in the Thai Burma Railway POW camps. 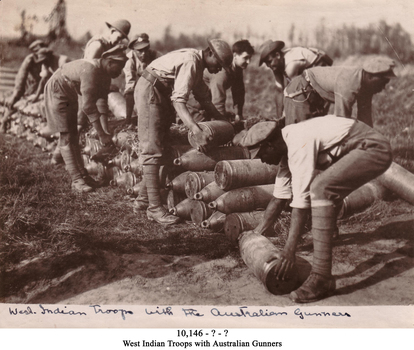 West Indian Troops with the Australian Gunners. Digital copy of photograph from a personal album of Lieutenant General JJT Hobbs. This diorama is the introductory feature in the World War 1 Gallery - 1918 experience. The figure shows details of the Lewis gun and webbing including the documented but irregular positioning of the entrenching tool. The diorama text discusses the transition from manpower to firepower with the restructure of infantry battalions to incorporate more light machine guns and to give the platoon an all round versus specialist capability. The increase in firepower and the reduction to three from four battalions in an infantry regiment in part offset the decline in voluntary recruitment. The offensive capabilities of an infantry battalion was therefore generally maintained but with 700 men instead of 1100 when fully manned . Large format glass slide for theatre announcement. 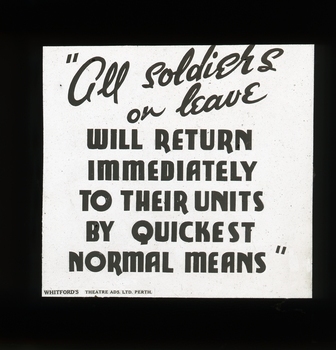 "All soldiers on leave will return immediately to their units by the quickest normal means"
Theatre notice produced by Whitfords Theatre Ads Perth for use during World War 2. 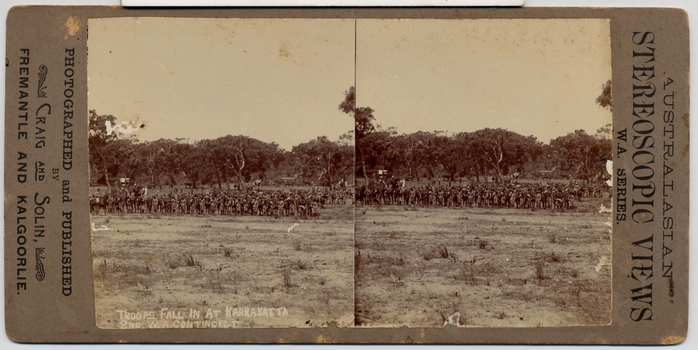 Presented by the Honourable Lord Mayor JT Franklin, CMG, MLC, JP, at a parade held at Karrakatta Camp on 7 April 1929. Consecrated by the Chaplain General COL Riley, OBE, VD, DD. 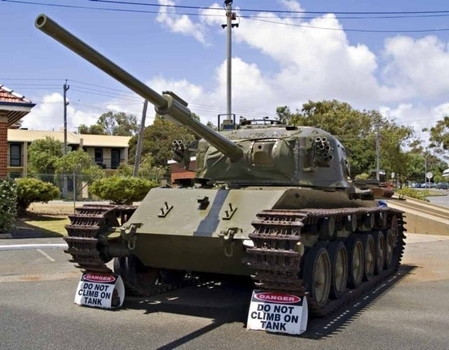 With the re-activation of the Citizen Military Forces (CMF) following the Second World War, the 11th/44th Infantry Battalion (The City of Perth Regiment) was raised in 1948 as a linked battalion to carry on the identity and traditions of the pre-war 11th and 44th Battalions respectively. The King's and Regimental Colours formerly held by these two battalions were passed on to the new battalion who paraded them in rotation on ceremonial occasions. Under major reorganisation of the CMF in 1960, all individual infantry battalions that existed at the time within each State were amalgamated to form State regiments, taking effect from 1 July 1960. Thus from that date the 11/44th, 16th and 28th Infantry Battalions were amalgamated to form The Royal Western Australia Regiment. 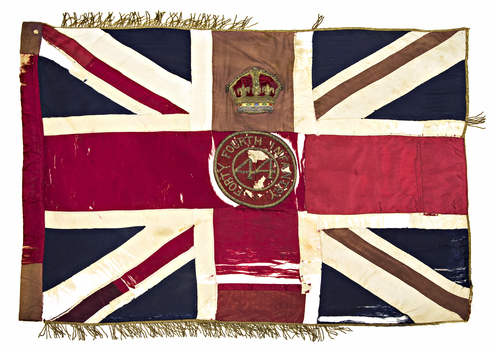 In September 1960, at a ceremonial parade held at Northam Camp, the Colours carried by all former battalions were handed over for safe keeping by the new regiment These former colours were subsequently laid up in the undercroft at the State War Memorial, King's Park on 29 November 1964. These were transferred to the Army Museum of WA in 1988 as part of the Bicentenary Colours Project. Presented, together with a new King's Colour, by Major-General JS Whitelaw, CB, CBE at a parade of the 16th/28th Infantry Battalion (The Cameron Highlanders of Western Australia) held on the Esplanade, Perth, 26 August 1951. (Refer to item 7 for specific details relating to these new colours and for details of previous colours presented to 16th Battalion). 16th/28th Infantry Battalion became unlinked in March 1952 with both 16th and 28th becoming independent battalions within their own right Under major reorganisation of the CMF in 1960, all individual infantry battalions that existed at the time within each State were amalgamated to form State regiments, taking effect from 1 July 1960. Thus from that date the 11/44th, 16th and 28th Infantry Battalions were amalgamated to form The Royal Western Australia Regiment. In September 1960, at a ceremonial parade held at Northam Camp, the Colours carried by all former battalions were handed over for safe keeping by the new regiment. These former colours were subsequently laid up in the undercroft at the State War Memorial, King's Park on 29 November 1964. These were transferred to the Army Museum of WA in 1988 as part of the Bicentenary Colours Project. 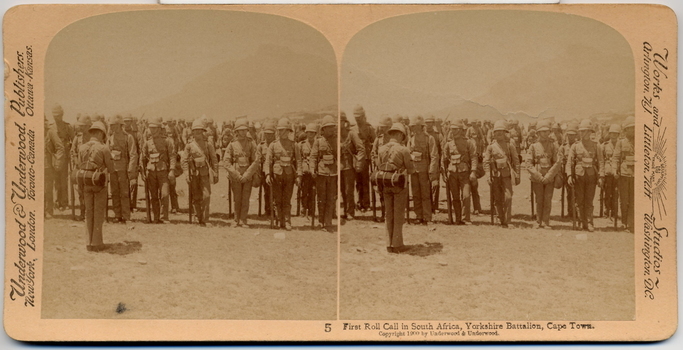 The battle honour for South Africa has incorrect year dates and should be "SOUTH AFRICA 1902". Reasons supporting this are:- •	The Battle Honour "SOUTH AFRICA 1902" was originally granted under Military Order 123/1908 to the Goldfields Infantry Regiment of Western Australia. 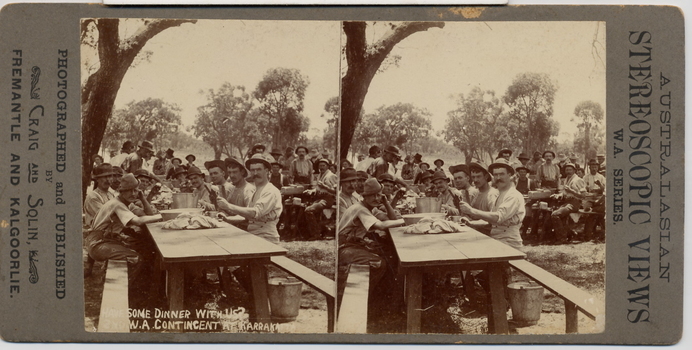 •	Under 1921 reorganisation of the Citizen Forces, the existing units in the Goldfields area were formed into 16th Battalion (The Goldfields Regiment) to maintain the identity and traditions of 16th Battalion (AIF). This unit inherited the above battle honour. •	All editions of the Australian Army List since 1927 have shown this battle honour for 16th Battalion as "SOUTH AFRICA 1902". This diorama is the introductory feature in the World War 2 Gallery - New Guinea and Islands area. A private soldier is shown in mixture of green and khaki uniforms, US style long leggings, long trousers with Thompson and Owen guns. 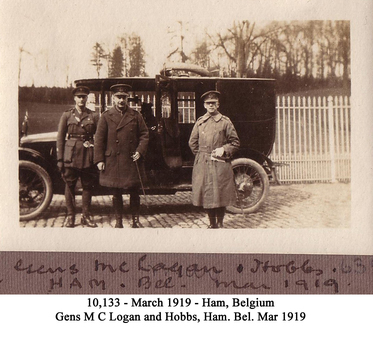 Generals MC Logan and Hobbs, Ham, Belgium, March 1919. Digital copy of photograph from a personal album of Lieutenant General JJT Hobbs. Mixed media / textile art from Department of Culture and the Arts, Artist in Residence program 2015 by Michele Eastwood. 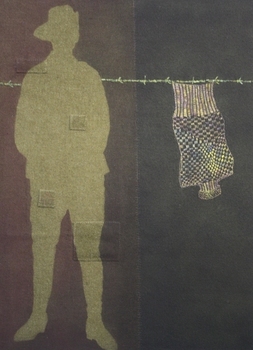 The hand knitted sleeveless jumper in the Museum, made by Sergeant John Ellwood Rudd of the 48th Battalion was the inspiration behind this work. With great ingenuity John Rudd unwound the knitted socks sent by the women back home. Creating knitting needles fashioned from the barbed wire surrounding the POW camp he was incarcerated in, he knitted a jumper to help him through the freezing winters of Germany in the First World War. Original artefact was inspiration for this artistic interpretation. 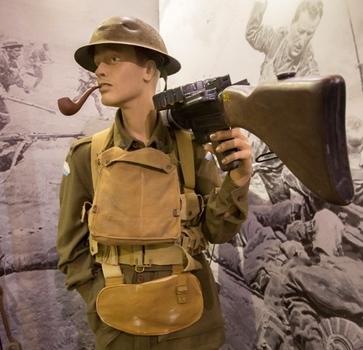 The Artist in Residence program enabled research of the Museum's collection of artefacts relating to 11th Battalion AIF. Access was provided to the behind the scenes storerooms of uniforms, banners, photographs, artefacts and diaries. Michele summarised her experience with the project as follows: "It was an interesting experience and a topic I would not probably have considered had I not been asked. The mixture of history and the people who lived through these times has been an absorbing and rewarding journey for my art practice." 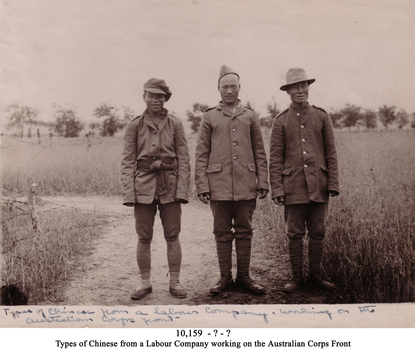 Types of Chinese from a Labour Battalion working on the Australian Corps Front. Digital copy of photograph from a personal album of Lieutenant General JJT Hobbs.